Yoshis are Dragons!. . Wallpaper and background images in the Yoshi club tagged: yoshi nintendo nintendo characters drawing. This Yoshi fan art might contain anime, fumetti, manga, and cartoni animati. 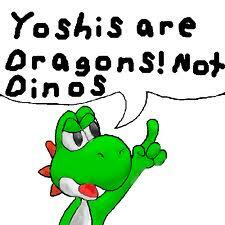 This here is proof there are people out there who also think Yoshi's a dragon!